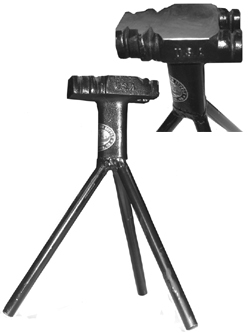 Both the cradle and the straight post with rubber cap are included with the Hoof stand. 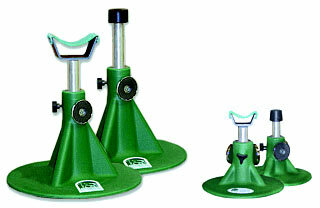 The HoofJack is a lightweight, durable hoof stand and cradle. Its base is a patented, extremely durable plastic that has been specifically designed to be stable and lightweight. Each interchangeable insert is constructed of a lightweight aluminum for strength and durability. The post is topped with a non-invasive rubber cap, while the cradle is constructed of a powder-coated aluminum with a durable woven-fabric sling. The inserts are easily adjusted to any height and held firmly in place with the tension knob. Each HoofJack is accessorized with two magnets for keeping track of your rasp, hoof knife or hoof pick. Hoofjack is designed to support the horse’s foot through all phases of trimming, treatment and daily care. Hoofjack provides a stable support for the horse to rest its foot on, allowing the horse to feel comfortable, secure, and relaxed, while reducing strain to the horse handler’s back and knees. Hoofjack will aid the horse owner, hoofcare professional and veterinarian in performing hoof procedures that would normally require support of the hoof by the handler.